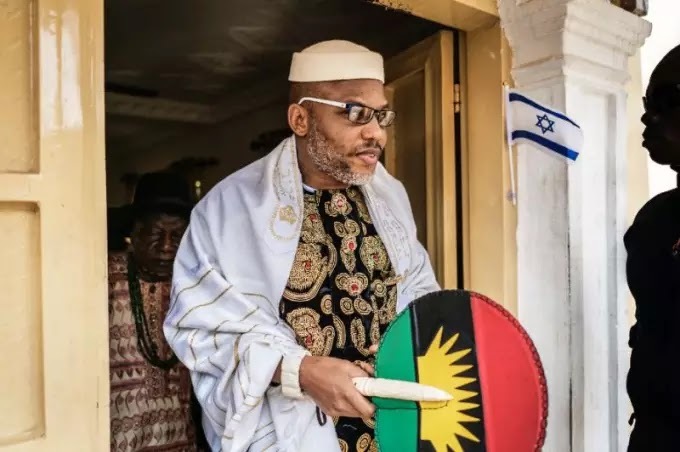 The Presidency has said sureties for leader of the Indigenous People of Biafra, IPOB, Nnamdi Kanu risk imprisonment if he fails to appear in court on adjourned date. Following a ruling by the Federal High Court in Abuja granting Kanu bail on April 25, Senator representing Abia South Senatorial District, Enyinnaya Abaribe, signed the bond for release of the IPOB leader. With his next court hearing coming up in October, the IPOB leader has not been heard from or seen after a combined team of security operatives invaded his house in Umuahia, the Abia State capital on September 14. Commenting on the effect of Kanu’s failure to appear in court, President Muhammadu Buhari’s Special Assistant on Prosecution, Okoi Obono-Obla said the court could issue a warrant of arrest for the IPOB leader. Speaking with Sunday Telegraph, Obono-Obla said, “The Federal Government has already filed a motion to set aside the bail of Kanu. “Following the military exercise carried out in Umuahia, Abia State and the subsequent proscription of IPOB, Nnamdi Kanu has not been seen and may have gone underground. “So it is not likely that he will appear in court on the next adjourned day for fear of being arrested by the police or security agencies. Kanu had sureties that entered into recognizance or signed bail bonds as ordered by the court that led to his release. “What is a recognizance? In law, recognizance is a security entered into before a court with a condition to perform some act required by law; on failure to perform that act a sum is forfeited. “The position of the law as provided under Section 173 (1) of the Administration of Criminal Justice Act, 2015, is that a defendant whom recognizance was entered on his behalf and who is subsequently released on bail is bound to appear before the court at every time and place to which during the course of the proceedings, the hearing may from time to time be adjourned. “The court also may issue a warrant of arrest where a defendant (Kanu) bound by a recognizance or bond fails to appear before a court or police station. It follows that if Kanu fails to appear before the Federal High Court on the next adjourned date, the Judge will likely order a warrant for his arrest. “The implication of the failure of Kanu to appear in court on the next adjourned date on those who stood sureties for his recognizance is that his recognizance shall be forfeited. “The court shall order his bond entered by his sureties to pay the penalty or to show sufficient cause why the penalty should not be paid. “It follows that Kanu’s three sureties will be ordered to pay N100 million each. Where sufficient cause is not shown by the sureties or the persons bound and the penalty is not paid, the court may recover the penalty from the person bound or from his estate if he is dead, in the manner laid down in the Administration of Criminal Justice Act, 2015 for the recovery of fine.